(Nanowerk News) The global rise in antibiotic resistance is a growing threat to public health, damaging our ability to fight deadly infections such as tuberculosis. What’s more, efforts to develop new antibiotics are not keeping pace with this growth in microbial resistance, resulting in a pressing need for new approaches to tackle bacterial infection. In a paper published online in the journal Nano Letters ("Engineered Phagemids for Nonlytic, Targeted Antibacterial Therapies"), researchers at MIT, the Broad Institute of MIT and Harvard, and Harvard University reveal that they have developed a new means of killing harmful bacteria. The researchers have engineered particles, known as “phagemids,” capable of producing toxins that are deadly to targeted bacteria. Bacteriophages — viruses that infect and kill bacteria — have been used for many years to treat infection in countries such as those in the former Soviet Union. Unlike traditional broad-spectrum antibiotics, these viruses target specific bacteria without harming the body’s normal microflora. But bacteriophages can also cause potentially harmful side effects, according to James Collins, the Termeer Professor of Medical Engineering and Science in MIT’s Department of Biological Engineering and Institute of Medical Engineering and Science, who led the research. These toxins can lead to sepsis and even death in some cases, he says. In previous research, Collins and his colleagues engineered bacteriophages to express proteins that did not actually burst the cells, but instead increased the effectiveness of antibiotics when delivered at the same time. To build on this earlier work, the researchers set out to develop a related technology that would target and kill specific bacteria, without bursting the cells and releasing their contents. The researchers used synthetic biology techniques to develop a platform of particles called phagemids. These particles infect bacteria with small DNA molecules known as plasmids, which are able to replicate independently inside a host cell. Once inside the cell, the plasmids are engineered to express different proteins or peptides — molecules made up of short chains of amino acids — that are toxic to the bacteria, Collins says. “We systematically tested different antimicrobial peptides and bacterial toxins, and demonstrated that when you combine a number of these within the phagemids, you can kill the great majority of cells within a culture,” he says. The expressed toxins are designed to disrupt different cellular processes, such as bacterial replication, causing the cell to die without bursting open. The phagemids will also only infect a specific species of bacteria, resulting in a highly targeted system, Collins says. “You can use this to kill off very specific species of bacteria as part of an infection therapy, while sparing the rest of the microbiome,” he says. When the researchers monitored the response of the bacteria to repeated reinfection with the phagemids, they did not witness signs of significant resistance to the particles. “This means you can do multiple rounds of delivery of the phagemids, in order to get a more effective therapy,” he says. This is in contrast to repeated infection with bacteriophages, where the researchers found that the bacteria did develop resistance over time. Although Collins acknowledges that bacteria will ultimately develop resistance to any stress that is placed upon them, the research suggests that it is likely to take them far longer to develop resistance to phagemids than to conventional bacteriophage therapy, he says. A “cocktail” of different phagemids could be given to patients to treat an unclassified infection, in a similar way to the broad-spectrum antibiotics used today. But they are more likely to be used in conjunction with rapid diagnostic tools, currently in development, which would allow physicians to treat specific infections, Collins says. “You would first run a fast diagnostic test to identify the bacteria your patient has, and then give the appropriate phagemid to kill off the pathogen,” he says. The researchers are planning to expand their platform by developing a broader range of phagemids. They have so far experimented with a set of phagemids specific to E. coli, but now hope to create particles capable of killing off pathogens such as Clostridium difficile and the cholera-causing bacterium Vibrio cholerea. 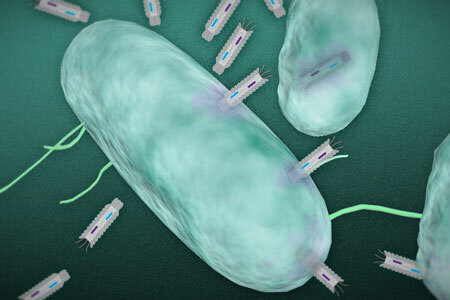 The paper demonstrates that using synthetic biology to modify a gene in a phage to make it more toxic to a pathogen can lead to more effective antimicrobial particles than classical approaches, says Alfonso Jaramillo, a professor of synthetic biology at the University of Warwick in the U.K., who was not involved in the research. 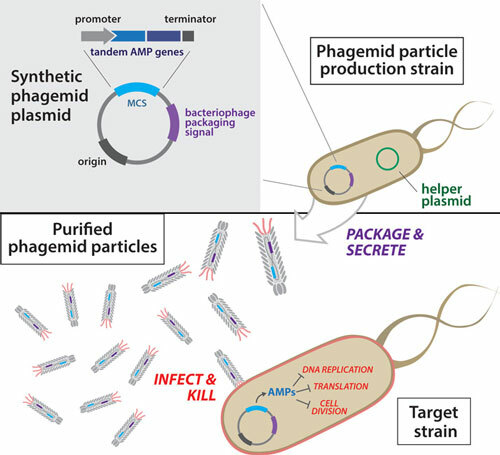 “Combining synthetic genetic devices with phages as delivery vehicles allows a systematic approach to reprogram pathogenic bacteria for death,” Jaramillo explains. “The [researchers’] focus on nonreplicative phages is also very appropriate because those particles are more feasible for use in people, as they are not considered genetically modified organisms,” he says. The researchers have created an improved form of phage therapy that may become the antibiotics of the future, he adds.